J…for juggling? Farmers many times beyond having their job of growing food and fiber, also volunteer as firefighters/EMTs, school board members, and for commission groups. We are farm bureau members and fight for what we believe in at the legislature. We also work to keep our crops alive, our families and soil healthy, and herds strong. Never in my life, until I started farming, did I realize how much of a juggling act “just a job” could be!! I think that is a great place to talk about agriculture! Juggling! I’ve certainly seen it first-hand. I know when I lived in a rural area of Mississippi (still missing tamales & crawfish!) there were lots of opportunities to be involved. And that crossed agriculture, bankers, teachers and more but with agriculture frequently having the largest footprint in rural areas, people working in it tend to have the opportunity to get involved everywhere (mainly cause if you don’t care about schools, the fire department, etc in your community who should?). One of the most vivid memories for me was about when it was time for the volunteer fire department to upgrade equipment, that depended on people in the community identifying the need, determining the expense, creating a fundraising plan, writing necessary grant proposals, etc. My nephew loved big machinery as a kid and that was one of his favorite parts about visiting me — he’d get to ride in tractors, fire engines, fishing boats, on 4-wheelers, etc. Somehow, my nephew just happened to be visiting shortly after the fire department upgraded some things. Being the good aunt, I had asked a friend if he had time to show my nephew how the new fire engine worked. He took time showing him the various controls in the cab and around the hoses, etc. 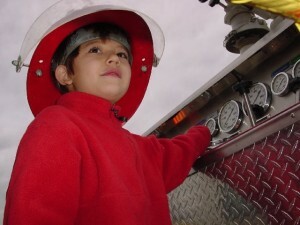 To add to the importance of it, he had my nephew wear a fireman’s hat. So I snapped photos like a mad woman! Look how cute he is! The tour was totally awesome. Taking time to explain which ones showed water pressure, where firemen stand, etc. Those things made my nephew’s day. As we finished the tour and began to turn our own directions, my nephew said thanks to the fire chief for being so awesome and took the hat off to hand it to him. However, the chief said my nephew could keep it as the firemen had gotten some new ones and so he was getting rid of the older ones. The look of wonder was amazing! We turned and walked back past a cotton field that was prepped and ready for planting once the weather warmed up enough, and my nephew looked at me with utter joy and sad in total seriousness that he had the hat now, he just needed to get the coveralls, coat and gloves if he decided to be a fireman when he grew up. He went on to explain he wasn’t exactly sure whether firemen had to buy their own gear or maybe the firehouse does, but either way, he felt he was a bit better off for being prepared. I could tell equally compelling stories about people in ag teaching Junior Achievement in the local schools that ultimately led one man to be the first in his family to ever buy a home instead of rent. Or of the local high school who couldn’t afford to stay open for a while. When a reevaluation was done years later, it was decided maybe they could pull it off and how the farmer who owned the land next to the school not only put good cotton ground to use as a football & track field but others joined him in getting the work done, finding & installing bleachers and buying uniforms so extracurricular activities wouldn’t be a casualty. When I had the chance to get involved with the local chamber of commerce and the performing arts center, I wasn’t the only ag face in the room. I had lots of company trying to figure out how to strengthen the economy, encourage small businesses and keep cultural events at the forefront. I’ve learned so much about how farmers when they have an issue in their area, work together to get it on the agenda at grassroots meetings and take it to others in the county & state for additional reach and action. So, Brenda, thanks for reminding me about how J is for jugging for farmers and others in rural areas and small towns. It is easy to forget when you have a professional fire department, and a larger population to allow people to pick and choose what they do knowing there are lots of others who can step up in the community as well. Its just not that easy if you are living in a town of 200! Friday is K day for the letter “G” so what do you think the word of the day should be? 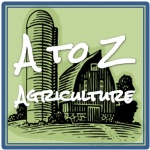 I think “K” could be for knowledge – the whole world is at your fingertips when you are involved in agriculture! It’s like the encyclopedia…in real life!